CAN YOU REALLY BALANCE A BUDGET BY CUTTING TAXES? « THE BRYCE IS RIGHT! CAN YOU REALLY BALANCE A BUDGET BY CUTTING TAXES? – Yes you can. Here’s how. As we have long known, the golden rule for making a profit is to maximize income and minimize expenses. Over the last few years though, government agencies at the federal, state, and local levels have violated this rule primarily by spending more than they take in. Such spending sprees are usually the result of campaign promises made to constituents. Let’s face it, it’s easier to get elected by giving things away as opposed to practicing fiscal restraint. Thanks to the Great Recession though, we have been given a wake-up call that we can no longer afford such giveaways and must learn to live within our means. 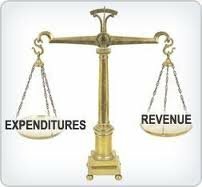 Following the golden rule though, in order to balance the budget, politicians should be raising taxes and cutting spending, even though this may place a burden on cash-strapped taxpayers and government officials accustomed to spending money unabated. So, is it possible for politicians to balance budgets while reducing taxes? As implausible as it may seem, Yes, it is not only possible, but the precedent was established a long time ago. The trick is to reduce government spending more than the amount we lower income taxes. Translation: the party is over and the government has to go on an austerity program whereby services are reduced and the size of government is reduced. Lowering taxes has the added benefit of stimulating the economy by providing taxpayers with more cash to spend, and fill government coffers with sales tax in the process. When it is necessary to supplement income in the face of declining taxes, there are other vehicles for doing so, such as raising fees for licenses. New Jersey Governor Chris Christie balanced his state’s $31.7 billion budget this way. He also used his power of the line-item veto to make final adjustments. Ohio Governor John R. Kasich inherited an economic nightmare, yet was able to balance the budget and finish fiscal year 2013 with a surplus of $552 million, approximately $408 million more than originally planned. Likewise, Virginia Governor Robert F. McDonnell also announced his state had finished the previous fiscal year with a surplus of $544.8 million. During his tenure as Governor of Massachusetts, Mitt Romney was able to turn the state’s economy around by pushing the legislature to roll back the state income tax from 5.3% to 5.0% (Massachusetts has a flat income tax). He also proposed a “tax-free shopping day”, a property tax relief for Seniors, and a manufacturing tax credit, all of which did wonders for rejuvenating the Massachusetts economy. The real proponent of this concept was President Ronald Reagan whose “Reaganomics” was another form of supply-side economics. The four pillars of Reagan’s economic policy were to reduce the growth of government spending, reduce income tax and capital gains tax (thereby freeing up money with consumers), reduce government regulation of the economy (to stimulate business), and control the money supply to reduce inflation. The rate of growth in federal spending fell from 4% under Jimmy Carter to 2.5% under Ronald Reagan. Many economists have stated that Reagan’s policies were an important part of bringing about the second longest peacetime economic expansion in the country’s history, and followed by an even longer 1990s expansion that began under George H.W. Bush in 1991 and continued through the Clinton administration with unemployment rates steadily decreasing throughout his presidency (7.3% at the start of his presidency and 4.2% at the culmination, with the lowest rate reaching 3.9% in 2000). Click HERE for more information. Balancing a budget means having to make some hard decisions and living within your means. Unfortunately, spending can be irresistible to politicians, particularly those running for reelection. The stark reality though is when you fail to balance the budget, you go into debt, your credit rating falls, you cannot pay your bills, and a general economic implosion occurs. Sound familiar? This is why most states have a balanced budged amendment and line-item veto (the one exception is Vermont). Even with such legislation, there is no guarantee states will abide to the budget, which explains why states such as New Jersey, Ohio, Virginia, and Massachusetts got into trouble originally. The budget simply establishes the guidelines for government to operate under. If they violate it, as many have, it usually means there is either a financial emergency, or someone is spending money irresponsibly. As to the federal government, I would wager on the latter and not the former. NEXT UP: THE POWER OF APPEARANCE – A guide for how appearances affect you in the workplace. This entry was posted on October 19, 2012 at 5:48 am	and is filed under Economics, Politics. Tagged: CAN YOU REALLY BALANCE A BUDGET BY CUTTING TAXES?, Florida, palm harbor, The Bryce is Right, tim bryce. You can follow any responses to this entry through the RSS 2.0 feed. You can leave a response, or trackback from your own site. “Some people still don’t get it. cutting taxes has worked over and over many times. it gets people to spend money. simple for most people. it keeps the recession back, not gone, because we are in a recession right now and it is getting critical. we have the worst government in the history of the US. Inflation has hit the middle class and the poor hard. the government claims no inflation. all they have to do to find out , is go to a grocery store, triple digit increase, and go fill you vehicle. Of course most in the higher government do no buy gas and grocery, the taxpayers are paying, and it is hurting the poor and what little is left of the middle class. you have a commie for president or Muslim. you have a complete fool for VP. it is obvious. “Back when the Sarasota Bay Bridge between Sarasota and Bradenton FL. was built it was made a “Toll Bridge” to amortize the cost of building. The Toll was set at $0.50 each way and it was expected to be paid off in 8 years, if memory serves me. After a while it was noted that the payoff was falling behind schedule so the City Council bumped the Toll to $0.75 each way and the payoff slowed even further! The City Council bumped the Toll to $1.00 each way and the Bridge revenues almost STOPPED! Finally, the Mayor stepped in and set the Toll to TWENTY FIVE CENTS over vociferous objections of the City Council and others. BUT, lo and behold, the Bridge was paid off YEARS ahead of schedule! “Excellent observation – if our federal tax money was spent wisely and the public sector administrators of our treasury were truly diligent stewards of our contributions than raising taxes would be the only rational solution to our problem. However, we are (seemingly daily!) having our noses rubbed in the excessive waste and abuse of our tax dollars with lavish parties and conferences, exceptional expenditure for the perfumed princes and princesses we elected, and gross negligence in the way of earmarks and wasteful “investment” in ridiculous non-essential and non-beneficial programs (the infamous shrimp on the treadmill comes to mind!) that we, the people insist that the government check out of the “all you can eat” financial buffet and get on the “fiscal weight watchers” program. “As usual, you are the voice of reason, Tim. We have to live within our household budgets, so why can’t our elected officials do so with such a large income? Maybe we need to give them a course in economics?